It was an intense first three days of the Copperheads main camp this past weekend. Players from all over Western Canada competed for a spot with the last year Heritage Junior league south champions . The successful club seen a record number of eighteen veterans return to camp trying to earn their spot for another season. It would appear from the outside looking in there would be minimal roster spots open. Instead additional talent coming to camp will force some very difficult decisions for the coaching staff. Thanks to post secondary institutions in the area, veteran players such as Jared Bainbridge (Airdrie Thunder); Christian Dees (Cochrane Generals) & Alex Saworski ( Sask Quakers) enhanced main camp. Goaltending is encouraging with overage Nolan Berner who put in a strong playoff performance last season for the Snakes returning along with a couple other talented goalies. The Copperheads will be narrowing their roster down throughout the week preparing for the start of the official season. Home Opener is set for Sunday, Sept 16 at 5:30 with the High River Flyers coming to the Snake Pit. Season tickets or individual game tickets can be purchased prior to puck drop on Sunday. 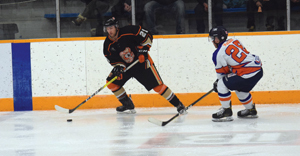 The Copperheads are still searching for sponsorship and willing participants to advertise in the arena. Visit our team web site for the brochure of levels offered (www.coaldalecopperheads.com).